A busy week for tennis in Pittsburgh wrapped up this weekend as the Merrill Lynch Men’s Futures of Pittsburgh and the National Collegiate Clay Court Championships/West Penn Amateur both came to a close in Mt. Lebanon. Pittsburgh’s Chad Kissell runs for a backhand during early-round action in Mt. Lebanon, Pa. The Merrill Lynch Men’s Futures of Pittsburgh is a USTA Pro Circuit event, offering prize money and valuable ranking points to those competing. The winner of the event, Emilio Gomez, walked away with the singles title when he defeated Alexios Halebian, 6-2, 6-4. The double’s title was claimed by two Canadian players, Samuel Monette and Isade Juneau. 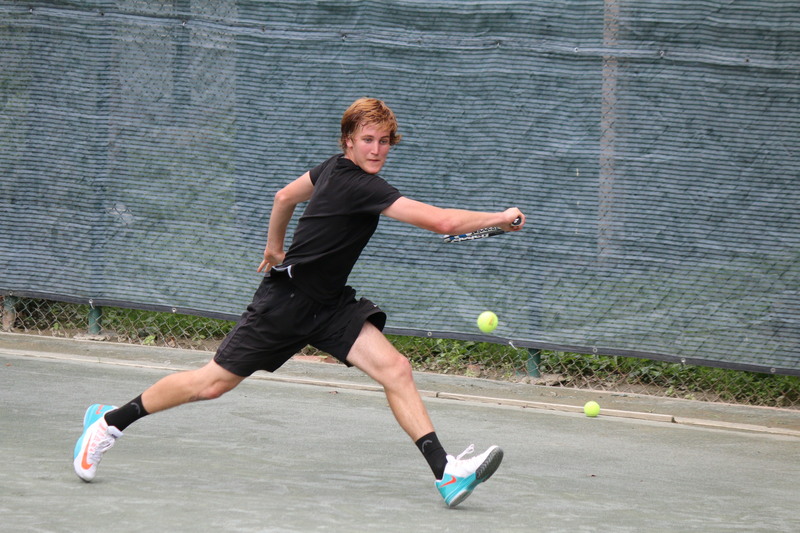 The Pro Circuit event took place for the 15th year this July, while the National Collegiate Clay Court Championships has been around slightly longer, with a 125-year history. The National Collegiate Clay Court Championships, also located at the Mt. Lebanon Tennis Center, brings together college players as well as amateurs from all over the east coast. The men’s singles winner of the tournament, Mitchell Marocher, defeated John Wu in a close final match, 7-5, 6-4. Wu had more to play for, though, coming through with a win in the men’s doubles final. He was partnered with Maxwell Kane. The duo of Wu and Kane defeated Chad Kissell and Garrett Gardner in the final match. In the women’s bracket, top seeded Anna Smith was defeated by Ryann Foster, 6-0, 6-1. In women’s doubles, Caitlin Bernard and Stephanie Smith took the title by beating Hailey Barrett and Yvon Martinez, 8-5. Photos from the event can be found by clicking here. News coverage from the Pittsburgh Tribune-Review.